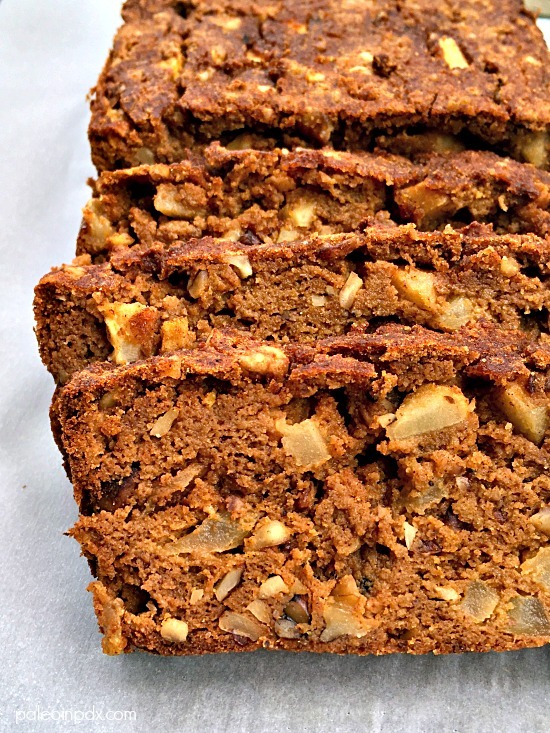 With its harvest flavors and warm spices, this delectable grain-free chunky apple pumpkin bread screams fall. Not only that, but it also creates a cozy, irresistible aroma in the house. This bread is not too sweet, and the texture is adorned with tender apple pieces and crunchy walnuts. It took me a couple attempts to get this bread right and while the first loaf tasted wonderful, it was way too moist and would not hold together. But, it was definitely still worth eating! After making some tweaks the second time around, it came out perfectly. Also, this bread tastes lovely on its own, but is enjoyable with butter, ghee or nut butter spread on top too. However you slice it, you can’t go wrong! Preheat oven to 350 degrees and grease a loaf pan with small amount of melted butter. I used this loaf pan, which is a medium size. Mix all the dry ingredients together in a mixing bowl. In a separate large bowl, whisk together the wet ingredients. Then, add the dry ingredients to the wet, and stir until smooth. Lastly, fold in the apple and walnut pieces. Pour batter into the greased loaf pan and place in preheated oven. Bake for 50-60 minutes or until toothpick inserted in the middle comes out clean. Let cool in pan for 10 minutes, and then carefully remove and place on a cooling rack. Let loaf cool completely before slicing. Store leftover bread in the refrigerator for up to five days. Great! You will love this bread, mom! So glad you like the recipe, Kari! I’m sure it’s wonderful with pecans. I might have to try it that way next time!